Last week, along with 4 other London bloggers, I was invited to Gintelligensia at Dusk, the pop-up bar on the terrace facing the river at Somerset House, for a promotional eve of gin mixology. I had ideas of being a gin-soaked DJ for the evening but it turns out we were there to learn about Bombay Sapphire gin; how it's made etc. As we sat bouncy on Tom Dixon chairs, Sam Carter, Bombay Sapphire Brand Ambassador, no less(!) took us on a BS historical world tour of the botanicals (spices) that go into the gin, using his globe trolley wotsit, with its fancy plinth (I love that word) and sapphire pins indicating where each of them comes from. Sam was great but, to be honest, my mind kept wandering. I kept saying to myself "This is his job; how bizarre! ", "how much is this costing? ", "this isn't my kind of thing*; can I go now?" and, more to the point, "Can I have a Guinness please?". I very quickly got to the point where I felt I'd sniffed and chewed quite enough seeds and bits of dry wood; I didn't really care enough and as for making a cocktail myself, I always think people look really silly shaking their shakers, and spinning the bottles about like Tom Cruise in 'Cocktail'. No. Thank. You. I am a pub girl. But the drinks did taste good. And who knows, I may yet become a BS convert. I will ask for it next time I fancy a G&T. I did have a nice time and it was good to see Tom again, and meet Jem and Jennie. 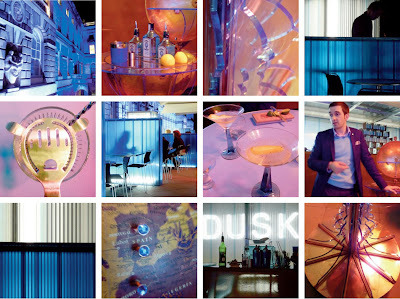 If all this cocktails in a plastic tent sounds like your kind of thing, Sam will be doing these eves up until 18th October – just contact him through the Bombay Sapphire Site. There you go... promotion over! *The last thing I was invited to do that wasn't my kind of thing got the one of the longest entries on here too.